Seats 36; L 12.30-4; D daily 6.45-9pm (reservations required), Set D €49; also à la Carte. House wine €22; Bar meals 12.30-4 & 6.30-9pm daily. SC10%. Closed mid Dec-mid Mar. Amex, Diners, MasterCard, Visa. 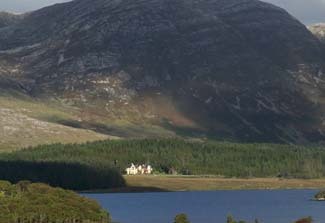 Maire O’Connor’s former sporting lodge on the shores of Lough Inagh makes a delightful small hotel, with a country house atmosphere. It has large, well-proportioned rooms, interesting period detail and lovely fireplaces with welcoming log fires, as well as all the modern comforts. Public areas include two drawing rooms, each with an open fire, and a very appealing bar with a big turf fire and its own back door and tiled floor for wet fishing gear. Bedrooms, which include one recently added room and several with four-posters, are all well-appointed and unusually spacious, with views of lake and countryside. Walk-in dressing rooms lead to well-planned bathrooms, and tea/coffee-making facilities are available in rooms on request. While it has special appeal to sportsmen, Lough Inagh makes a good base for touring Connemara and is only 42 miles from Galway; in addition to fishing, golf, pony trekking and garden visits are all among things to do nearby. Off-season breaks offer especially good value and its genuine pet-friendliness make it a very attractive destination for people travelling with a dog. Small conferences/banqueting (15/50). Children welcome (under 3s free in parents' room, cots available without charge, baby sitting arranged). Pets permitted (stay in bedroom free of charge). Garden, walking, cycling, fly fishing. Equestrian, sea angling, garden visits and hunting/shooting all nearby. Rooms 13 (5 junior suites, 1 family, 10 no smoking, 4 ground floor); room service (24 hr). B&B €140 pps, ss €20. Non-residents are welcome for dinner in this handsome dining room, by reservation. The cooking reflects the produce of the reion and gently adventurous, an enjoyable style that suits the house very well. Alongside the popular dishes like smoked salmon, pan-fried steaks, and lobster (when available), you may find specialities including starters of pan-fried scallops with julienne of vegetables and cider dressing, or a main course of medallions of pork with apple & fig comp&ocirc;te and marsala jus. Desserts, including a wide range of ices, are home-made, service is friendly, and portions generous. The wine list includes a fair range of half bottles, some non-alcoholic wines and, unusually, a rosé among the house wines. *Tempting bar menus are also offered for lunch, dinner and afternoon tea. N59 from Galway city, take right N344 after Recess; 5km on right.